Kids who love Santa AND trains are in for a treat on Saturday, December 9, 2017, when Virginia Railway Express (VRE) hosts the annual “Santa Train” event to benefit Operation Lifesaver. 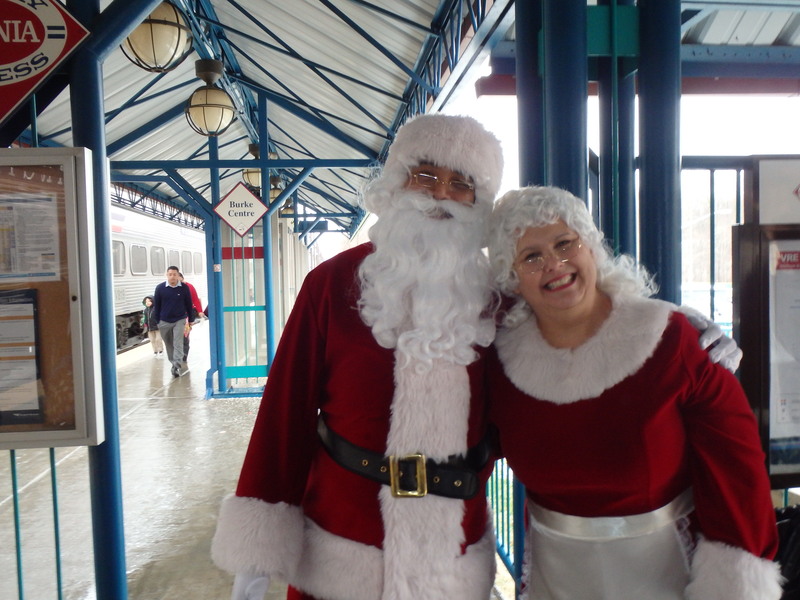 In an earlier blog post, we told you all about this very popular event that has Santa and Mrs. Claus ride along on various trains departing from four VRE stations. Now we have a chance for you to win a set of six (6) Santa Train tickets to this SOLD-OUT event! These highly coveted tickets sell out right away each year so we always buy a set to give to you, loyal Fairfax Family Fun readers… it’s our annual Christmas gift to you! The Santa Train tickets up for grab this year are for the Cupid Express leaving from the Burke Centre station at 9:30 am on Dec. 9. Please note that these tickets are good ONLY on this date and time and from this station, and that per VRE policies, ALL riders, regardless of age, must have a ticket (this means that yes, even babies need a ticket). Please refer to our original blog post to know more about what the train ride is like, and our top tips to make the most of your day. When you’re ready to enter our giveaway, just follow the instructions below! To enter this giveaway, simply leave a comment below before the deadline of 11:59 pm on Wednesday, November 29, 2017. One winner will be randomly selected by a third-party app. This winner will receive a set of Santa Train tickets to the sold-out Cupid Express ride departing from the Burke Center VRE station at 9:30 am on Dec. 9, 2017 (retail value: $30). The tickets are good ONLY for this station and this specific ride on this date. The winner will be randomly picked immediately after the contest ends and notified by email at the address used to comment on this page. The winner must reply to the notification email by 10 pm on Thursday, November 30, 2017, to claim the prize; failure to do so risks forfeiture. Alternatively, the winner may pick up the prize in person at public location in Fairfax County mutually agreed-upon with Fairfax Family Fun if scheduling works out. Contestants agree to abide by our giveaway terms and conditions. This giveaway open to entrants ages 18 and up. Share the post "Giveaway: Santa Train tickets"
Thanks so much for sponsoring this give-away. Our son would be thrilled if we were able to take him. We have tried every year and never gone. We were checking out at 9:02am this year and still failed. My 3 kids would love it! Pretty cool. Thanks for doing this! This would be a wonderful surprise for my son! I’d love to send him with my family if I am in the hospital with our 2nd little guy due, or maybe I’ll be able to go too! Your blog is a fantastic resource for my family of five! I tried to get Santa train tickets because I know it would be a dream come true for my two-year-old twin boys, but had no luck. We’d be thrilled to win the tickets! Oh my goodness, I tried to get tickets for this exact date, time, location and it was sold out when I signed on at 9:05 am! I would be so happy to win tickets for my girls! Thank you for the giveaway. I had 4 tickets in my cart and forgot the baby needed one. Went back to add her and they were all sold out. It was quite depressing. Our 3 year old daughter loves trains, and she would love this train ride! My 3 yo simply adores trains and this was in our wish list but I didn’t get a chance to grab tickets before they got sold out. I’d love to surprise with this amazing adventure! Would love to win! I was so disappointed not to get tickets. My son really wants to go! How exciting! It would be the best day ever!!!!!!! We love everything trains! Thank you so much for doing this! Our kids (and myself) would love this! I wish we can have them!!!! We’ll love to go! ?????? Every year I try to buy the tickets, but are sold out before I can even buy them.? I tried last year too but then no luck. I really want to take my little ones 5 and 3 to really have an experience before they grow too old. So, it would be nice if I can win then this year.? What fun! Our son and his friends in his Cub Scout den would be so excited about this train trip. Thank you. WOW!! Thanks for letting me know about this event! Maybe next year I’ll keep an eye out for these tickets. Have a wonderful holiday and thanks for keeping us in the loop with events for the family. Our family would Love to win these train tickets. We tried to log on and buy them, but they sold out within minutes of coming up for sale. Thank you for the opportunity to win tickets! I hear it’s a great time!!!! My daughter loves Santa so much. She is 5. She’ll love to go. Thank you for even given us a chance to win your Christmas gift! We’d love to go! My 5 yr old and his best friend would love this! We’ve never been and would love to experience it! I ***NEED*** to win this! What an awesome opportunity! Thabk you! This would be a first for us to attend since we’ve never been! Thanks for the chance..
It’s been a crazy/rough couple of weeks in our house so santa cheer is just what we need! Sounds like so much fun! We would love to go. So cool! Hoping to win! We would love to win these! Thank you for the opportunity. I logged on at 9:04 and they were sold out. We just moved here and really wanted to experience our very first train ride! Thanks! Thank you for the opportunity. I logged on at 9:04 and they were sold out. We just moved here and really wanted to experience our very first train ride! Thanks a lit! We’ll love to go, thank you! We would love these tickets! I tried and failed to buy for this exact excursion! Thanks for sponsoring. My daughter would love to see Santa! We were so sad we didn’t get tickets Monday. We’d love the tickets. I’ve tried every year for the past 5 years to get tickets! Whoever gets them, please enjoy! Sounds like fun! Would love a chance to go! I would love to take my two daughters! So thankful for a second shot at these tickets! We are trying to make this Christmas extra special for our kids. Work is sending our family to Hong Kong for the next 3 years, so we are making the most out of our last Christmas at home. Winning these tickets would be a dream come true! Thanks for hosting such a cool contest! This looks like a great activity! Good luck to everyone! Awesome giveaway. What a fun event. We would LOVE to go on the santa train!!! We have never done this and my daughter would love this! Whenever we are in Clifton, she loves waving at the VRE as it zips by. Thank you for this offer – you guys rock! My boys would DIE of excitement to get to ride the train and see Santa! I was so bummed we disnt get tickets. Let’s cross our fingers! Believe in the magic of Christmas!!! No only my kids will love this experience but also me. Good luck to everyone! ??❤?? We would love the opportunity to ride the Santa train! Thank you for the giveaway! What a fun Christmas idea! Hi, my family and I would love to get tickets for the train ride! Thank you. Would love to win theses! ! What a great giveaway. Thank you! My kids would love to be able to do this!! My boys would love to do this! My children would love to do this! We’d love to go! So fun! Amazing! I would only need two tickets, but would love to win some! Would love these!!! ? ? What a wonderful treat! That would be so fun!! I have a 6 year old train-obsessed little boy who would be thrilled to go on the Santa Train! I would love these tickets! Due with baby #2 any day and it would be such a nice thing to so for my older son as he goes through the big brother transition! Thank you for offering this giveaway. My children would love this! This would be a lot of fun for the kids.Thank you! I’d love to win these tickets! My kids love the Santa train! We went once and it was great! My children (and I!) would be thrilled for this chance. So sweet of you to do this. This sounds like a wonderful family event! How nice to post and comment. These tickets are harder to get than rock concert seats! We just missed out on tickets and would love to take our 2 year old twin boys on their first train ride with Santa! This train ride is such a wonderful event! It’s perfect for kids….not too long but not too short! Love it every year! This is such a great opportunity for a family because those tickets sell so fast! We would love to attend because I’ve never been able to get tickets. we just move here from Atlanta. my boys love to see the VRE train ride by in Lorton. We would love these tickets! Thanks so much for this giveaway! Would love to win the tickets!!!! This event looks like so much fun! My son would love this. Good luck to everyone! What a generous gift to give!! My little boys would absolutely adore this as they never been and we didn’t have a chance to get the tickets! We have tried to get these tickets every year for 7 years with no luck! I know whoever wins will enjoy the magic of the Santa Train. New to the area and hope to make the Santa train a new holiday tradition. We would LOVE to win these tickets this year!! My kids would love to attend this! I’ve never been able to get tickets. It sounds like such a fun event. A great way to spread the Christmas spirit!!! Oh we would love this! Thank you for hosting such an amazing giveaway! Oh, how I wish we could win these. My 3 year old is a train loving little boy, but I wasn’t fast enough to get tickets to this years train ride. My family would love this opportunity! Thank you for your previous post including tips to purchase the tickets. I tried to get tix but my fingers weren’t fast enough and the tix flew out of my cart before I could purchase. So this would be a dream if we could go! Thank you for this and all your posts. Thanks for another chance! I had the tickets in my cart and they sold my it while I entered my payment info. Happy holidays! This would be a dream come true to take my children! ❤ Thank you for the chance! Would love to take our kids. Really hope to win. Totally feel like I let down my boys even though I did get on at exactly 9:04 and site said tickets sold out. Fingers crossed!!! We’ve never been and my kids would love this! Would love to win tickets! My 3 year old would absolutely love this! My four year grandson loves going on the Santa train. His parents missed tickets this year and were so sad. This would make the holiday for my dear family. I am pinning all my Christmas wishes on these tickets. Thank you and Merry Christmas! My daughter will really enjoy this giveaway. She love trains and she is very excited waiting for visit Santa somewhere!!! Thanks for the opportunity to participate in this amazing trip!!! Thanks for the opportunity to try to win tickets to this great event. My husband and I would love to be able to take our son. Wishing everyone the best of luck! I would love to win these tickets. I’ve missed these tickets 3 years in a row now! I know my 3 boys would *love* this so thanks for another chance! Would love to get these! My daughter would love to go on this train ride! She loves trains and Santa!! Thank you for the giveaway! My 4 year old Autistic son would love to go! Thanks regardless! Thank you for this offer! I’d love to take my 2.5- year old daughter – she loves trains. This looks awesome! The Yoo family would be thrilled to attend! Thank you! Thanks for the chance to win! How great! We tried and missed out. My two children would love this experience! Thanks! I was on at 9:00 and missed out on tickets again this year. I have a 5-year-old and a 2-year-old that love trains and Santa. My 4 year old would love this! I’ve tried to get tickets the past two years but always miss out somehow. This is an amazing giveaway! Thanks for the opportunity! Happy holidays! Can’t wait to try this event!! Thank you for posting about this and hope we can attend. My grandson would love this! Thanks so much for the opportunity to take him. Happy Holidays to you! We tried to get tickets and missed them. I’d love to take my son! This would be such a fun activity for my kids! My family would be estastic to attend. Good luck to everyone. How fun! My family would love this! We would love to take our kiddos to this. Thanks for making this possible for a lucky winner! We have never been, but heard that it’s a lot of fun for the kids! Wishing everyone luck on getting these hard to find tickets. We would definitely put these tickets to good use! We are new to fairfax county, a family of five, and have never been on a train in the area. Thank you for the chance to win! My son loves trains. This would be awesome to win this great prize. Thanks for giving us a chance to do so. Would love to go and see Santa on the train! We would love to win these tickets! My family has never been before and I know my family would love them ! Thank you for this chance! Our family would love to go on this ride! My husband and I would love to take our grandchildren on the Santa Train. They are 2.5, 3 and 5 years old. I know they would love it!! This is one of the rides my kids are longing to sit on and meet Santa. Keeping fingers crossed. Hope we can attend this as a family. Thank you! This blog is such a wonderful resource for family activities in the DC metro area! We are a family of five, and my kids would absolutely love to go on the Santa train! What a wonderful opportunity! May the winner and his/her family have the merriest Christmas ever! We’re a military family new to the area and would love this! My kids love trains and who doesn’t love Santa ? What a fun event! Thanks for offering this giveaway! My kids and I would love to see Santa in a train! It can’t get better than that. Good luck to eveeyone! Please add our name. My children would love something like this. Let’s ride with mr ? and mrs ? , we would love to do this as family. It would be our first time, yay! Thank you for this opportunity! Happy Holidays!!! Thanks for the opportunity! My family would love to go ? Thanks for all the tips about this event and for the giveaway! I hadn’t heard about the Santa train before seeing your posts on Facebook. nice giveaway, here’s hoping we get to ride the train! My 3-year-old would absolutely LOVE this event. She has not managed to meet Santa yet due to illness in her younger years before she got tubes in her ears, so this would make her (and her parents’) year. 14 years and 3 kids and we’ve never had a chance to nab tickets for the Santa train. “We Believe!”, Santa, this is our year. Thank you so much for giving us a chance. Merry Christmas! Thank you for doing this! We haven’t had a chance to experience this yet and I know my 6-year-old and almost-4-year-old would have a blast. Our daughters would love this. We have never been. I would love to get these tickets for my family. Pick us! This would be such a great treat for my son and niece!! I hope we get picked. Thanks for the chance either way!! We have never done this and would be such a great surprise for my kids :). My oldest daughter’s birthday is on Christmas day and she turns 10 this year! Good luck everyone! Thank you for offering this many tickets. I have a family of 6 and usually to win anything for families, I often see 4. We would be very grateful to be able to experience such a fun activity. Good luck to whoever wins! Thank you for this opportunity for the Santa Train tickets. This sounds amazing! We’d love to go! My kids would absolutely love this! It sounds like such a fun experience! Winning these tickets would officially confirm to my son that I am the greatest dad in the world! Our family would LOVE to go! Thanks for giving us the chance!!! My family would love this . We have never been ! Thanks so much !???? Love the contest! My daughter would love to ride the Santa Train. This would so fun—my daughter would love it! Pls pick us!!! This is an amazing giveaway! I will feel like the best mom ever if I can get some tickets! What a great offer. My grandsons would love it. This sounds like so much fun. My grandsons would be thrilled. What a great give away. My grandsons would love it. So nice of you! Fun idea! This sounds like fun for our three year old! Thanks for the chance! Your blog is great. What a great giveaway. I’ve never been able to get tickets! This would be such a wonderful treat! Happy Holidays! This would be a great event for the kids! We have always wanted to go – so nice of you to offer this giveaway! Thank you! Would love to be the lucky winner as a special surprise for my son and daughter! Our daughter would love love this opportunity. She’s obsessed with trains AND Santa. Crossing our fingers! This is an awesome opportunity. My 9 year old would have a blast seeing Santa and Mrs. Claus. She’s never been on a train ride so this would be really fun for her and our family. I will keep my fingers crossed. Thanks again for this amazing opportunity. What fun!! My 4 year old has been asking to ride a train; imagine her excitement if it happened to be this!! ? Please pick me!!! My kids would love this. Thank you for sponsoring the giveaway. My family would love to be chosen! It would be so nice to watch my babies faces light up at the train and Santa ! Good luck everyone! This would be such a fun event for our kids. Would love to win! We weren’t able to purchase tickets because it was sold out. We would love to go!! I have never been and my family would love the opportunity to enjoy this. Thank you so very much for the chance of a lifetime. My boys and their two friends love trains. We promise every year we will go but are never able to get tickets. Just once we would love to surprise them with a Santa train ride and to shate the memory with their friends. What a fun treat no matter who wins!! Thanks for doing this ? Would love to win and take my whole family! This would be an amazing gift! Love the Santa train!! My son is FINALLY warming up to Santa and would love a choo choo ride with him! My kids would really enjoy this. Happy Holidays to everyone. Awesome! My youngest loves Santa and trains. My 3 girls would LOVE to go on this! Thank you for doing this giveaway!